Since most media companies wish to continue to use their on-premise technology while moving new workflows and burst capacity to the cloud, the dominant on-premise market presence of the Vantage Media Processing Platform makes it the perfect choice to support these hybrid workflows. Vantage Cloud Port was created to address these applications. With the new consumption-based actions in Vantage Cloud Port, users pay for media processing results—and not for additional software licenses or infrastructure (e.g. space, power). As media files are orchestrated, Vantage Cloud Port automatically provides intelligent and efficient management of cloud storage, avoiding egress fees and providing operational efficiencies that are easily monitored. Workflows can be made to burst in peak demand situations – you’re ready for worst case workload without constant over provisioning. Consumption based pricing protects your bottom line. Best of breed partner integrations that have made Vantage the industry standard are now available in a flexible hybrid cloud offering. Vantage users can ease into the cloud – a hybrid approach is a natural next step for existing systems. Because it’s Vantage, you own & control your workflows. 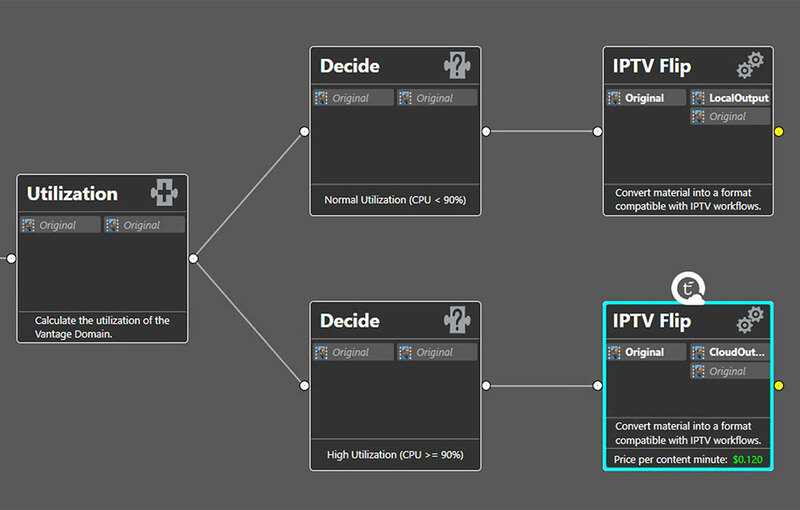 Workflow Designer resides on infrastructure, but some or all media processing can be in the cloud. Workflows deploy into the cloud using containerized micro services with transcoding engines identical to on-prem services. Telestream Cloud orchestrates services and ensures visibility. In addition to the flexible licensing options already available for the Vantage Media Processing Platform, Vantage Cloud Port enables consumption-based operation (and pricing) for Vantage actions. More specifically, Vantage Cloud Port defines a set of media processing actions which can be run in a consumption-based, SaaS mode. 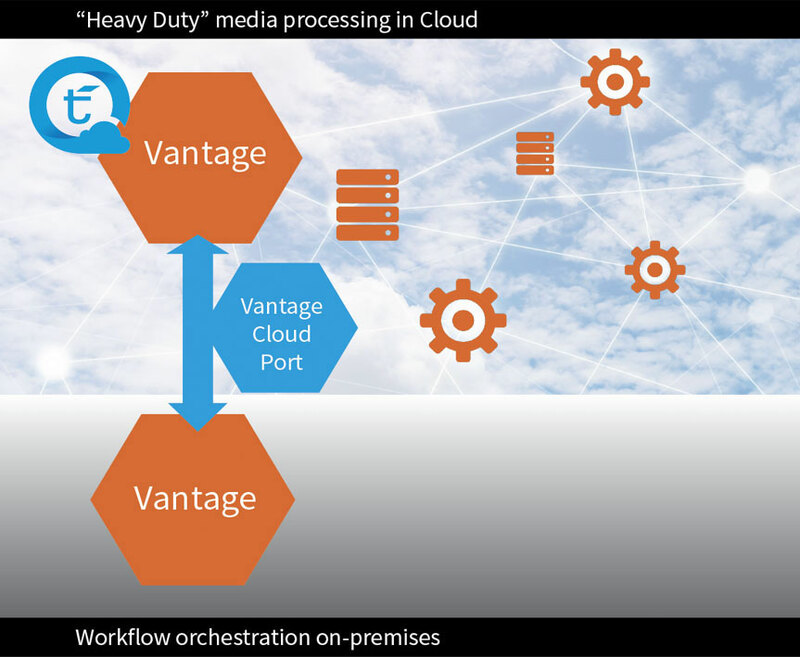 These Vantage Cloud Port actions tackle the heavy-duty media processing while Vantage software handles workflow design and orchestration. Workflows are built with the Vantage Workflow Designer and run by the Vantage orchestration engine. Vantage users own their workflows and determine where the orchestration engine runs and who has access. Adding Vantage Cloud Port does not change this operating model. Vantage Cloud Port enables actions placed in a cloud-mode to run within Vantage workflows—providing the same outcomes as infrastructure-based Vantage actions but with a consumption-based operating (and pricing) model. Whenever a Vantage action is cloud-enabled via Vantage Cloud Port, a Telestream Cloud icon is added to the action within the Vantage workflow (see example diagram), and operators are presented with a cost to run a Vantage Cloud Port action at the time of configuration. 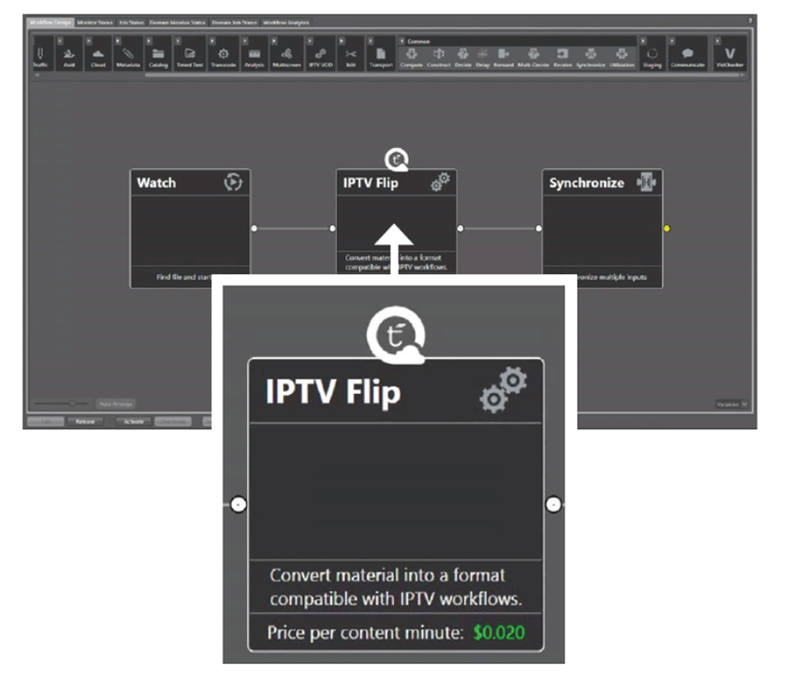 And while a Telestream Cloud account is required to be able to leverage Vantage Cloud Port, all of the workflow design and orchestration happens within the Vantage Media Processing Platform. Vantage Cloud Port users reference their Telestream Cloud console for information about minutes used and billing totals for their cloud-enabled actions. Workflows with cloud-enabled actions (via Vantage Cloud Port) can have a characteristic where “workflows follow the media.” This is accomplished by designing workflows with decide actions and a new location action to conditionally route files. If media lives in the cloud, Vantage Cloud Port actions can process it there. When necessary, Vantage Cloud Port actions can automatically move media to the cloud, which is most efficient when media is headed for cloud storage anyway. Workflows can be set up to make decisions on whether to process “on-prem” or in the cloud. Being “storage-aware” means Vantage workflows with Vantage Cloud Port actions are seamless across storage locations. Furthermore, Vantage Cloud Port actions can be switched from local to SaaS mode to expand capacity and to respond to resource demands. With Vantage Cloud Port, operators can manually configure existing actions for SaaS mode or dynamically scale out the necessary processing resources as close to the content as possible. For example, Vantage Cloud Port actions can burst to SaaS mode automatically when system load reaches a predetermined threshold. Workflows would be manually configured to do this using a new utilization action to produce variables, and decide actions to act upon the variables. Vantage Cloud Port couples the power of Vantage with the simplicity of SaaS. New advanced workflows can leverage cloud processing without any onboarding. To take advantage of Cloud Port, you simply install Vantage 8.0 and you can begin to augment your on-premise processing. Please contact your Telestream Representative.